I’ve been missing California lately, so for today’s Gallery Mondays, I picked a piece of art I saw while visiting Hammer Museum in Los Angeles—French artist Henri de Toulouse-Lautrec’s Touc, Seated on a Table. I love how the table isn’t really the first thing you see when you look at this painting, yet it’s in the title. The dog has this “get away from me” kind of look about him, which makes it kind of humorous. 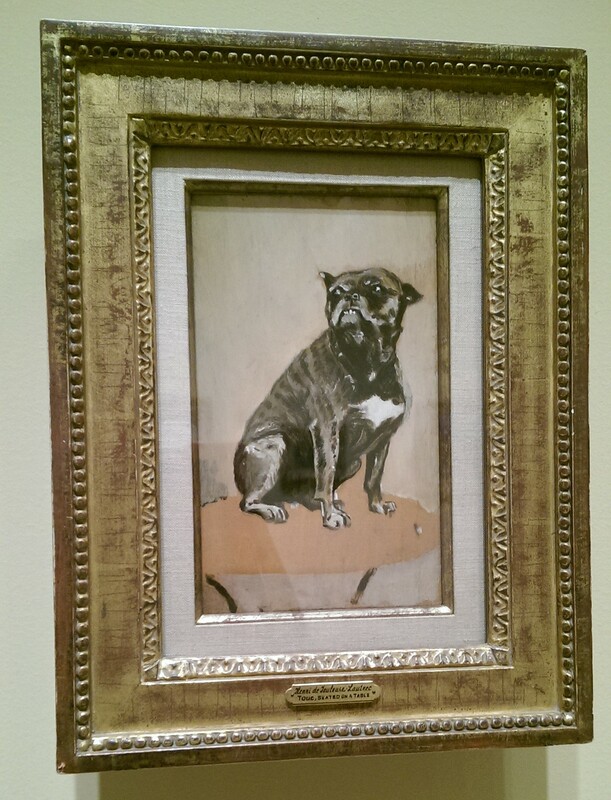 I’m guessing this dog was at one of the cabarets Toulouse-Lautrec hung out at while he was alive. I’ve tried to find out if the name Touc has a meaning, but Google was of no help. And I can’t for the life of me tell what breed this dog is. A part of me wants to rename the dog. Or at least give him an alternate name. He shall be nicknamed Garion. It means “guard” in French, and I think he’d be a pretty ferocious guard dog. Check out this article from the LA Times about the painting.